I live fairly centrally in London and am lucky enough to be able to walk to work. This is a huge bonus for me because I save about £100 a month by not having a travel card and I don't have to deal with being on a packed tube every morning. My walk is about 2.4 miles and takes me about 35 minutes. Some people in London just wouldn't walk that, and indeed I see plenty folks getting on a bus only to get off a few stops later, their journey no quicker than mine. I walk briskly and on my journey I listen to podcasts, so that by the time I'm at my desk I've had a good bit of exercise for my body and my brain. 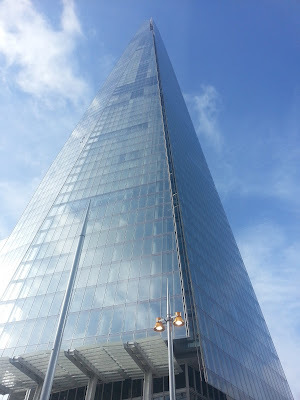 I'm very lucky that I get to pass some of the most impressive parts of London along the way. 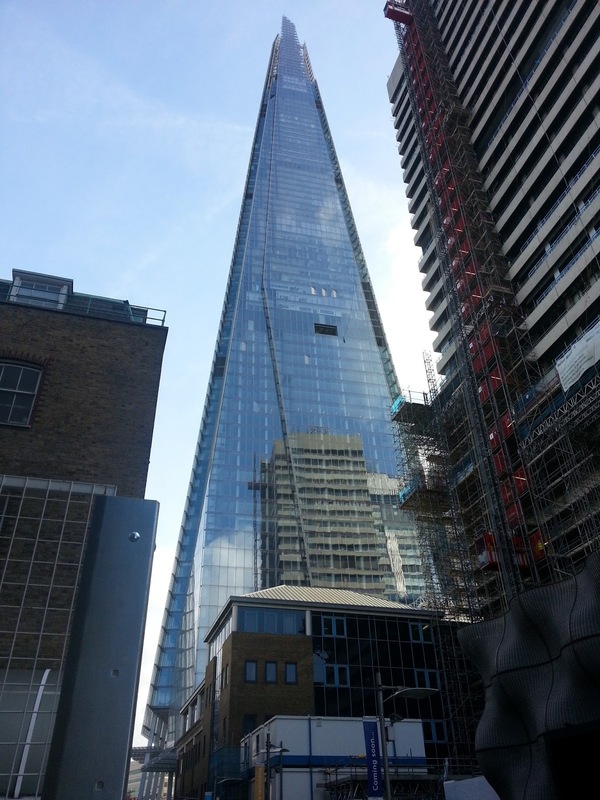 I moved to London before the Shard was completed and thus had to walk through a building site almost every day. It's been great to see it finished although there is still a lot of construction on in the area including Guy's Hospital which you can see reflected in the Shard in this image above. I walk through London Bridge Station along with hundreds of others who have commuted in from the South and are making their journey into the city. I'm a fast walker so I duck in and out of people but usually try to keep to one side so I can make my own pace. Sometimes I find walking amongst this crowd a bit depressing. Everyone is dressed in black or grey, most people look miserable. On Fridays they all drag wheelie cases because they clearly can't wait to get out of the city the moment 5pm hits (I personally love London at the weekend). Often I am the only flash of colour I can see on the bridge, my yellow trench or red pea jacket stand out a mile. Occasionally a film crew pitches up on the bridge making it harder for everyone to get through. I've lost count of how many productions my face must appear in. 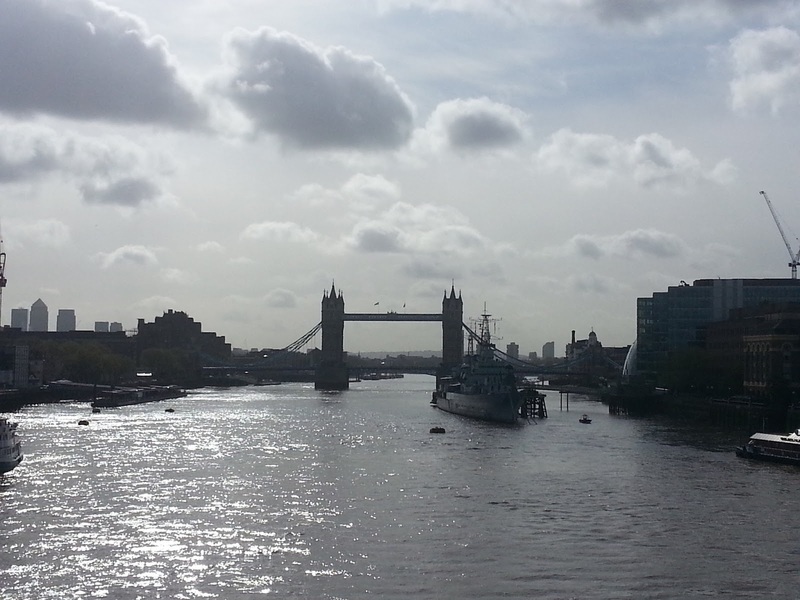 As I walk over London Bridge every day I see this view of Tower Bridge and it still amazes me even 18 months after moving here. I've seen this view in all weathers and lights and it's incredible how different it can look. In winter the HMS Belfast (seen in front of the bridge) is often lit up with coloured lights and I can always see the flashing light of One Canada Square in the distance (the pyramid topped skyscraper to the left). Sometimes I find my route incredibly exasperating, particularly due to being pushed free newspapers and magazines by various people all along the way. On most days I pass 10-12 but I've seen it be as many as 17 along the entire route. Often religious preachers make London Bridge their stage and, despite my headphones, it can feel really aggressive to have someone yelling at you that you need to be saved before you've even eaten breakfast. Closer to work is Spitalfields market, a place that I loved to visit as a tourist before I moved to London. 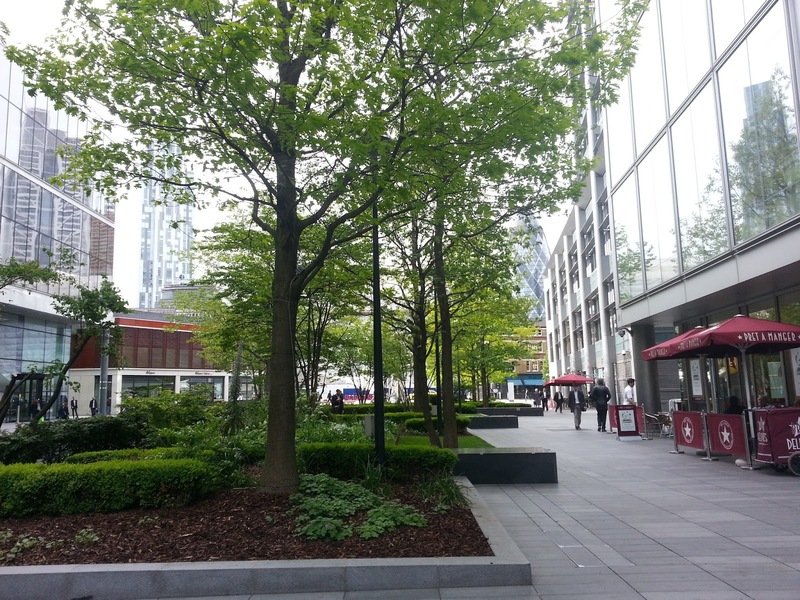 Even though it's nestled in between some of London's tallest buildings, the trees make it feel like a much more relaxing space so by the time I get to my building any frustration from the walk is long gone. Oh I miss London! I know people find it depressing/ busy/ crazy but I love all that haha! I miss the mad rush. It's great that you walk to work - 35 mins is a perfect amount of exercise to get everyday and that's a good short commute!